Both land based and boat fishos have been experiencing a fantastic run of tailor in recent weeks. With local water temps as high as 21 degrees there is still loads of baitfish kicking around with good numbers of tailor and salmon chasing them. In the last couple of weeks there has been numerous reports of big schools of salmon and tailor up to Gladesville in the Parramatta River. 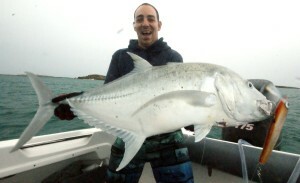 As the weather slowly cools we are now seeing the numbers of trevally increase in the harbor and in the bay. 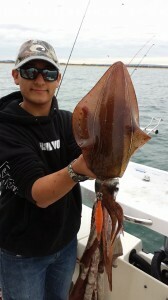 Squid numbers are starting to drop off but there’s still some big hoods being caught. 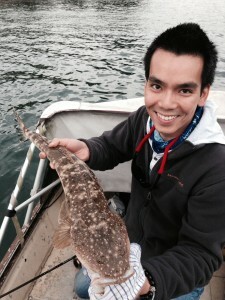 Flatties are still being caught in the harbor and in the bay. Local fisho ‘Tommy’ has been landing a few quality fish working the shallows and edges of Rose Bay on lightly weighted 5” plastics. Reports of some nice snapper out in the 70m mark have been coming in with some good fish amongst them. Now is as good a time as any to pick up that prized big winter red you’ve been dreaming about. Game fishing is starting to slow right down but those with pelagic blood are eagerly anticipating a good run of yellowfin tuna in the coming months and for their sakes hopefully the bluefin show up as well. Matthew Zahra landed his first marlin off Sydney in late May on a pakula hothead phantom. The fish was tagged and released. Well done champ! Inshore anglers are still getting some nice kingies in close due to the warmer water sticking around but expect them to start pushing out wider to deeper reefs like ‘The Peak’ and ’12 Mile’ as the water temp drops. Places like ‘Long Reef’ and ‘The Colours’ have bee producing fish with the usual methods of jigging, plastics and live baits all working. After a glorious “Indian Summer”, winter is finally beginning to bite on the far south coast of NSW and the target species list is changing as a result. 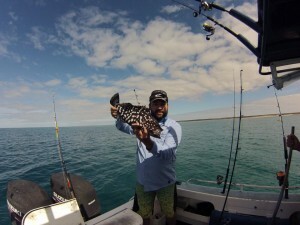 While a few eating-sized dusky flathead continue to be taken in the estuaries, the emphasis is now shifting more towards bream, blackfish and silver trevally. 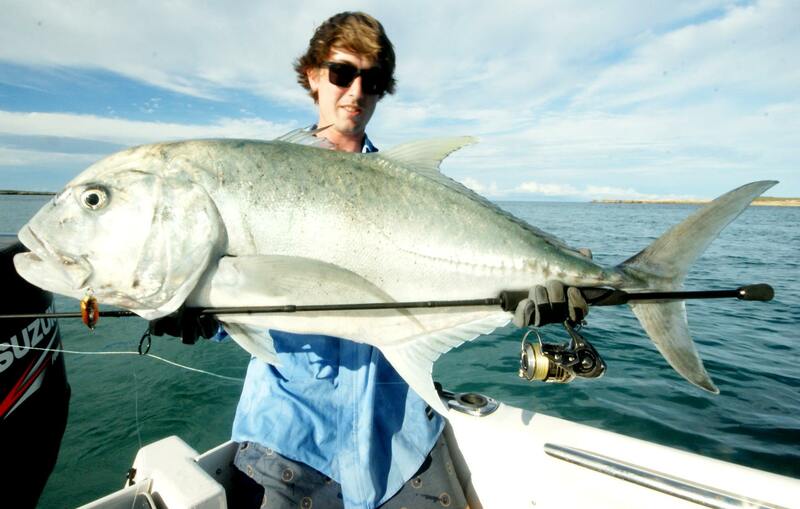 In particular, it has been a great autumn and early winter for trevally and tailor, with large amounts of baitfish still present in most estuaries. Winter is bream time on the far south coast of NSW. Jo Starling landed these two cracking southern black bream on fly near Tuross. Image source: Steve & Jo Starling. The keen and hardy types are still pulling the odd mulloway, but the emphasis has shifted from daytime fishing with soft plastics to night fishing with live and dead baits. The highway bridge over the Clyde River at Batemans Bay remains the areas most consistent jewie spot, with fish to 14 kg having been taken in recent weeks. The Batemans Bay region has been producing some nice Jewies for those putting in the hours. Jem Abbott landed this 25kg croaker one night off the beach. On the rocks and beaches, Australian salmon continue to dominate catches, although some solid bream and the odd tailor have also come in. This is always a great time of year for chasing drummer and blackfish from the rocks as well. Offshore, the water remained warm for much longer than expected and has only just begun to cool, finally slowing the yellowfin tuna, kingfish, marlin and shark action that continued in waves until the end of May. The big question now is, will the southern bluefin tuna come through in numbers over coming months? Only time will tell, but the signs look promising. A few snapper continue to fall to baits and soft plastics and, perhaps surprisingly, the shallower grounds inside the 40 metre mark have generally produced the better run of fish. Further out, morwong and pigfish tend to dominate bags, while on the drifting grounds the sand and tiger flathead seem fewer but larger as the water cools. 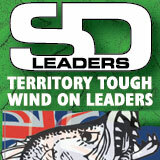 Reports of plenty of bream and mullet have been coming in from the Tweed coast as well as reports of tailor. Gold Coast locals Dan and Greggo Weaver have been getting some nice bream around Hastings Point on fillets of WA Pilchards cast into the wash around the rocks. Considering the abundance of mullet in the area there’s no doubt that hard Jewfish fishos are capitalising on the situation and hitting their usual haunts with live baits and big plastics in search of Jew. Ben Knott from Newcastle sent in this pic of a nice dusky flathead caught recently. Tweed 9-Mile is still firing with reports of some big late-season wahoo being caught 1-2 weeks ago. 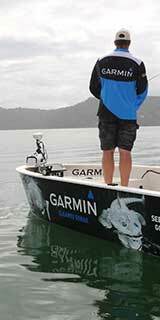 Fish up to 25kg have been taken on Hex Heads while trolling. The trout season on streams closed at the end of the Queen’s Birthday weekend, with some excellent catches of lovely brown trout taken right up until the closing day, especially following some good rainfall at the end of May. Rainbows, however, remain scarce in most of the high country lakes and streams. According to reports there’s been a few snapper, squid and jew around of late. Like many parts of the country now is sort of an in-between season where we are seeing summer species disappearing and winter species slow to move in due to warmer than average waters (currently still 22 degrees). Small pan sized snapper around 50cm have been providing good sport on light gear in the bay which is typical for this time of year. The next month or so the bigger fish should start pushing in with the cooler water, likewise with the tailor. Pelagic activity in the bay has really backed off now. The rivers are still producing good numbers of threadfin and a few jew. The size range of threadies being caught has been up to 80cm. Most are being caught on live bait plus a few on lures, live mullet and herring being the livies of choice. 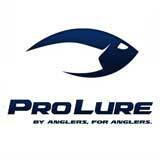 For advice on threadfin and jew fishing drop in and see the crew at The Tackle Warehouse in Camp Hill. 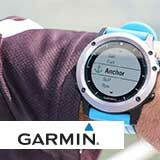 The staff are regularly out on the water and have their finger on the pulse when it comes to what’s biting and where. Around the shorelines of the bay bream, whiting and squid are still being caught in good numbers. Whiting and bream are being caught on prawns, worms and small soft plastics. 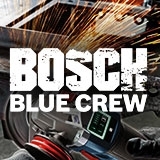 Reportedly not much has been happening in the offshore scene. 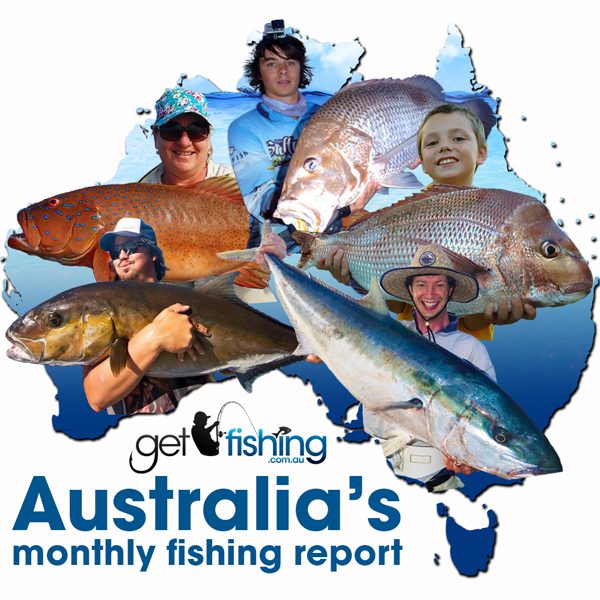 Among the highlights on the Goldy at present is the coastal tailor, bream and mullet activity. 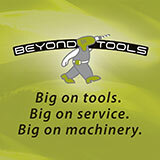 Standard sized tailor around the 500g to 1kg mark have been in reasonable abundance around local headlands. Dan Weaver fished the rocks at Burleigh one morning for a nice feed of tailor on small metal lures. 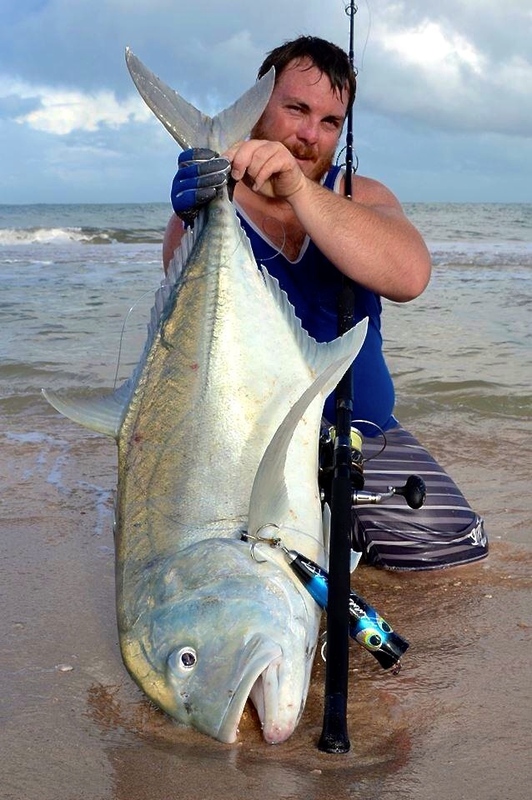 There’s also been reports of tailor caught at the spit as well as a few small jewfish. In other news offshore snapper are starting to turn up around the local 24’s with the arrival of cooler water. 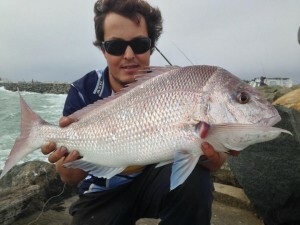 There have already been reports of some nice snapper to 60cm being caught on 5” plastics. Early morning and late afternoon are prime times for snapper and jew with pilchards, filet baits and soft plastics being standard offerings that work well. 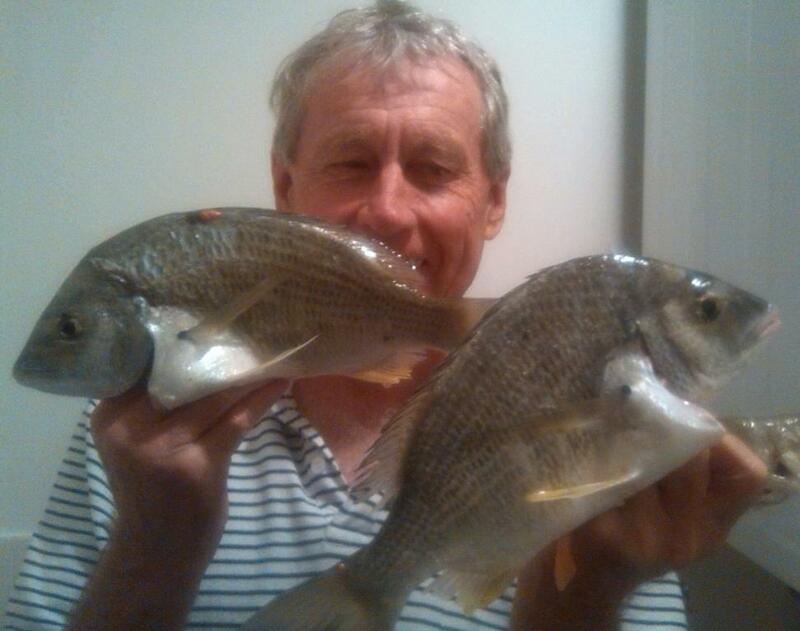 Bream and whiting are still being caught around local river entrances between Southport and Tweed. Soft plastics, fresh nippers and crabs have been working well which is not surprising. Phil Brandon has been catching some nice bream with his grandson Bailey off the rock walls around Currumbin. Young Bailey is a big fan of catching fresh crabs and cunji for bait and the pair of them have been rewarded with some big bream to 1kg for their efforts. In the canals it’s been the usual story of bream and jacks on lure and bait with the odd soapy jew thrown in the mix. Compared to the dire fishing experienced throughout April the last few weeks have been fishing quite well. The cooler mornings have made for perfect conditions for inshore boaties. Spotted and doggy mackerel have been entertaining inshore anglers in the channels and around rockwalls. Bigger Spaniards up to 15-16kg plus plenty of smaller 5-8kg models have been caught around Cape Cleveland and Salamander Reef. 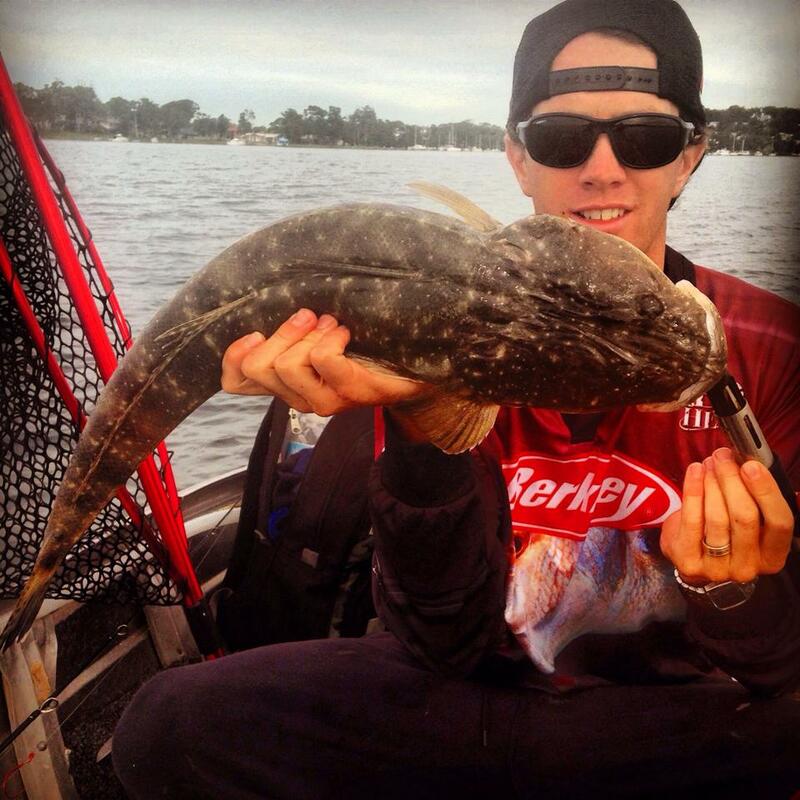 Coby Pasco with a nice fingermark and grunter sent in for our monthly Rapala Fish Of The Month competition. Further afield the reef fishing has been quiet, largely due to poor offshore weather conditions. In saying that there have been reports of some nice large-mouth nannygai coming from waters between Townsville and Lucinda. The wind really needs to be getting down around 10-15 knots for pleasant outings to the reef, while at the moment they’re more in the order of 15-20 knots or greater. All along the local beaches and down south there have been plenty of reports of hood hauls of whiting, bream and flathead on peeled prawns and yabbies. 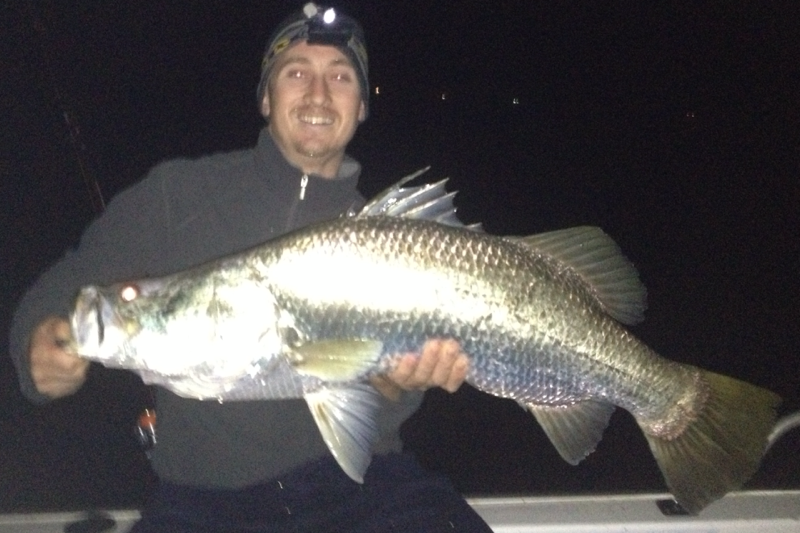 While fishing the Akwa Marine Predators Tournament last weekend Glen Tweedie put in the long hours after dark and managed a nice 98cm saltwater barra. While it wasn’t the winning barra of the tournament it was likely one of the biggest salties weighed in. Glen Tweedie with a lovely 98cm barra landed during last weeks Predators Tournament. 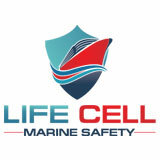 Image source: Fishing Warehouse Townsville. This time of year in Darwin the locals are shifting their focus to pelagics. There’s plenty of bluewater action happening right now including a great run of Spanish mackerel and longtail tuna. Plenty of sailfish have been sighted but not many have been caught. 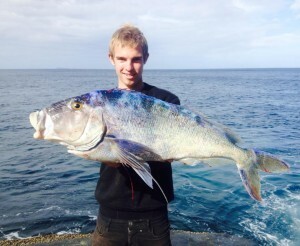 Out of town places like Dundee beach have also been fishing well for pelagics. This weekend could be a good opportunity to get out there amongst it, as there will be little movement in the tides. However, just keep an eye on the wind. In the harbour barra and threadfin have been fishing well. Those getting amongst the action have been fishing plastics with particular mention of the versatile Zerek prawn pattern lures being the undoing of many good fish. Bynoe Harbour has also been performing well for barra and fingermark. Reports of good hauls of mud crabs are still coming in. Known mud crab hot spots like Shoal Bay are still producing pretty well with reports of people still catching their bag limit. Overall it seems like the barra fishing is starting to slow down a bit, however in saying that the billabongs are still fishing ok. A few Fishing & Outdoor World regulars have been getting good numbers of small to medium sized barra in the freshwater upper section of Shady Camp, with fish around the 60cm mark being the average. Places like Kakadu will start opening up over the coming weeks but some billabongs are still too wet. 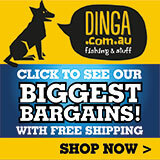 Those planning on heading out to the billabongs are best enquiring about access with their local tackle store or planning a trip with a local guide. Fishing in the south of the state has been good all round over the past month or so. Land based fishos Nathan Brown and Jacob Crispe are among those who’ve been getting into the action from the stones around the Albany region. Among recent captures are some respectable samsonfish, blue groper, queen snapper and harlequin fish. Nathan Brown – Albany land based samsonfish. 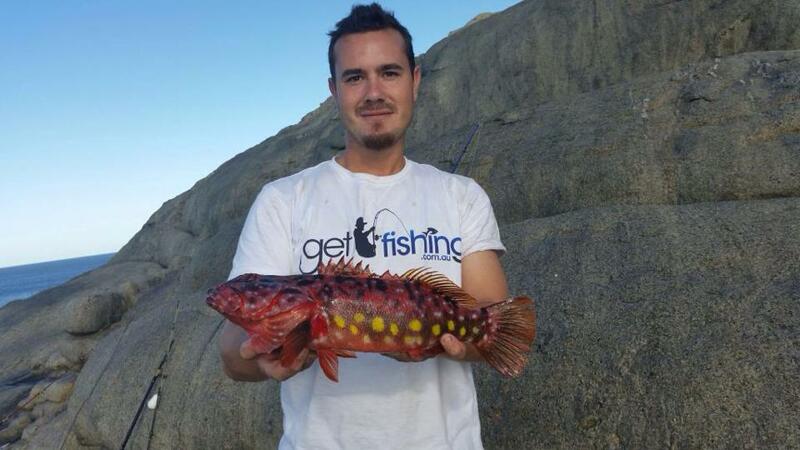 Nathan Brown displaying one of many harlequin fish landed off the rocks recently. Also getting into the action from the stones this month was Cowan Wise from Albany. 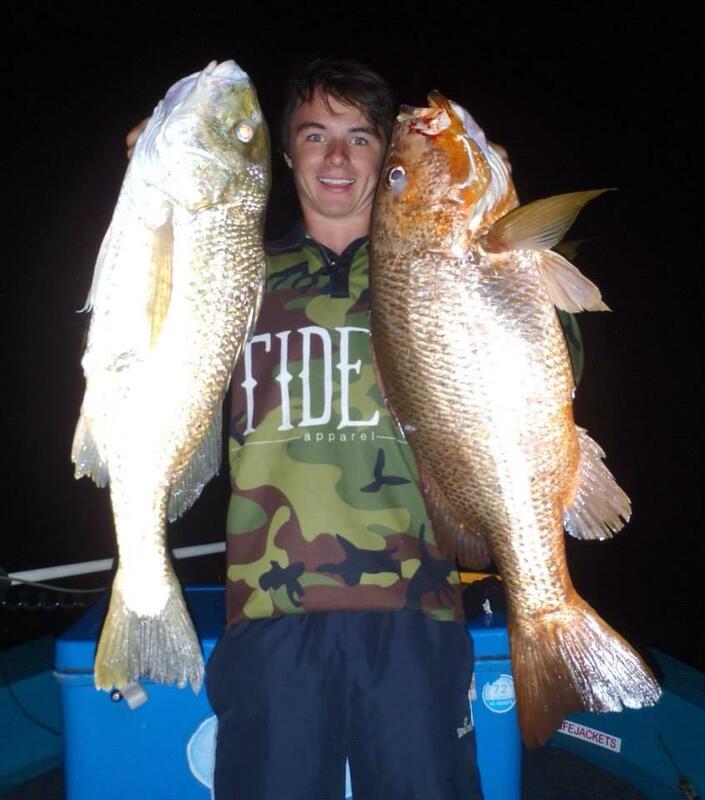 Cowan sent us in a few photos of his recent captures for our Rapala Photo Of The Month Competition including a thumping big queen snapper and a nice sized snapper. In other south-west news the odd salmon is still being caught although their numbers have backed off significantly. A lot of squid are being caught with reports of anglers cleaning up during the recent Yamashita Southern Squid Spectacular in Albany. For those targeting herring, Salmon holes and surrounding areas in Albany is said to be holding loads of fish and is worth a look. On the salmon front Garden Island has been producing big schools of fish although their occurrence has been spasmodic. Metro anglers have continued their success on medium to large pink snapper, with fish coming from local rock walls and inshore reef systems. 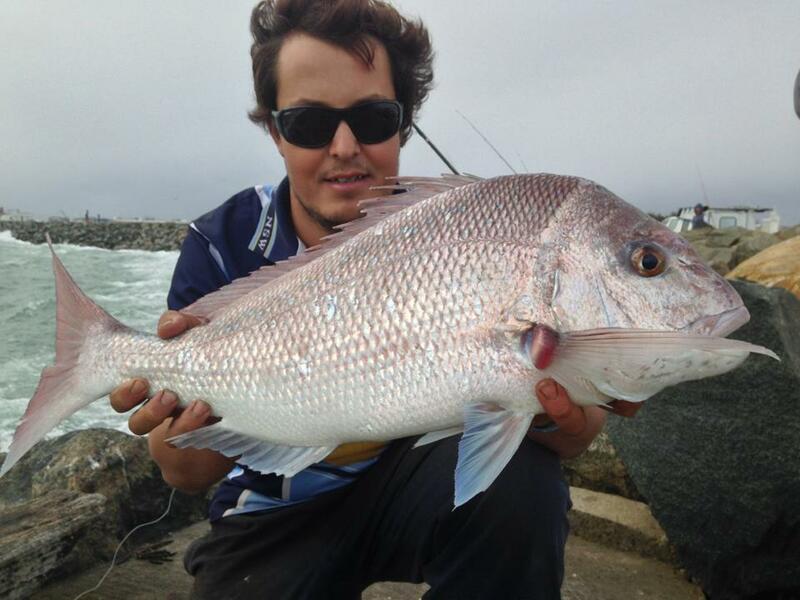 Harley Brown caught this typical North Mole snapper during a recent southerly blow. 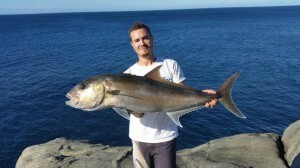 Get Fishing forum moderator Matty Fawcett was tickled pink one evening during a northern suburbs hot bite. Matty and his mate landed 5 fish for the evening with the biggest two going 8kg and 11kg. Yours truly had the in-laws over from QLD recently and seized the opportunity to entertain the father in-law, Phil Brandon with a memorable session on the pinks as well as a few other species including a late-season 14kg metro mack. The full write up and pics can be found here The Unlucky Spaniard. Cockburn Sound is still holding good numbers of pink snapper although getting them to bite is proving more fickle than usual. Laith from Bluewater Tackle World Myaree fished with a mate the north end of Garden Island recently for 6 pinkies to 74cm and 3 x 15kg samsonfish on 8lb line. 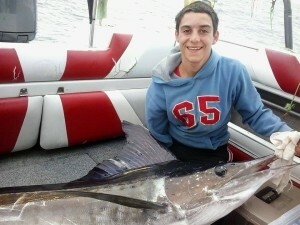 Laith also fished Cervantes on Monday with staff member Luke Ryan. The fishing started off slow but by midday things started to fire. Between the pair they managed some nice dhufish to 13kg, 3 big baldchin groper, some big breaksea cod and assorted other species all on jigs. In other coastal news there is still reports trickling through of large rogue samsonfish popping up in marinas and around inshore snapper grounds. One lucky angler hooked and landed a solid longtail tuna from the North Mole recently, however most pelagic activity has started to die off considerably. 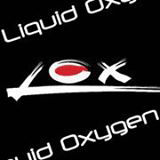 Squid are still pushing in for inshore and land based anglers but not yet in huge numbers. 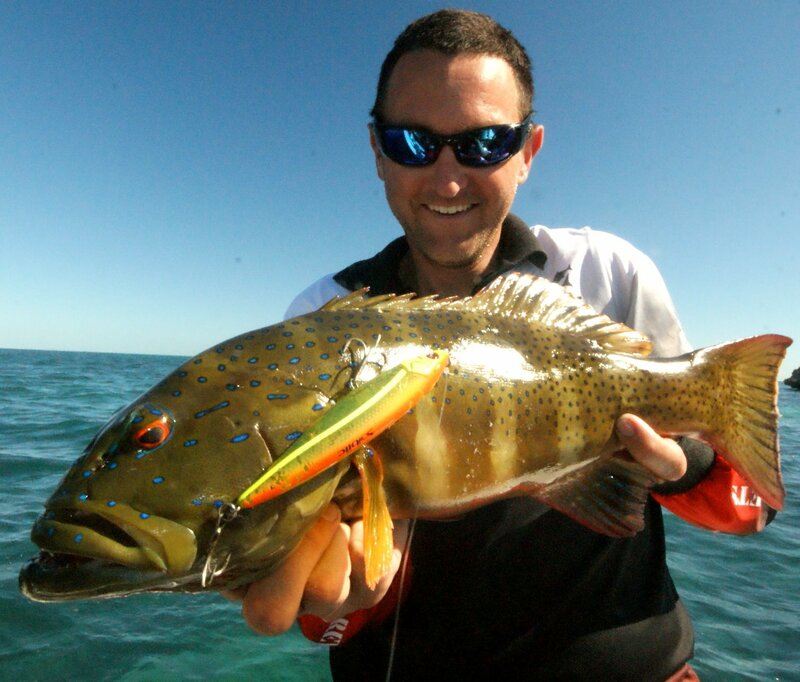 Mulloway are still a worthy target for land based anglers. Fish up to 25kg have reportedly been caught along Perth’s metro beaches between Tim’s Thicket and Lancelin, the further north and south providing the better fishing. In the Swan river there’s been plenty of bream being caught, however the post new moon phase at present isn’t doing any favours. A few keen souls have been hitting the water at night in search of king prawns but reports suggest it’s still a bit early. For those lkeen to get into the action try heading down on the next big tide after a downfall of heavy rain. According to Clay from Seasport Tackle beach and jetty fishos have been treated with good numbers of quality fish including mulloway to 25kg, sharks and snapper. Prime times for these predatory fish are at night or around tide changes during the day, particularly around the full moon. Plenty of herring, yellowtail and squid are being caught off the jetty and in the marina. 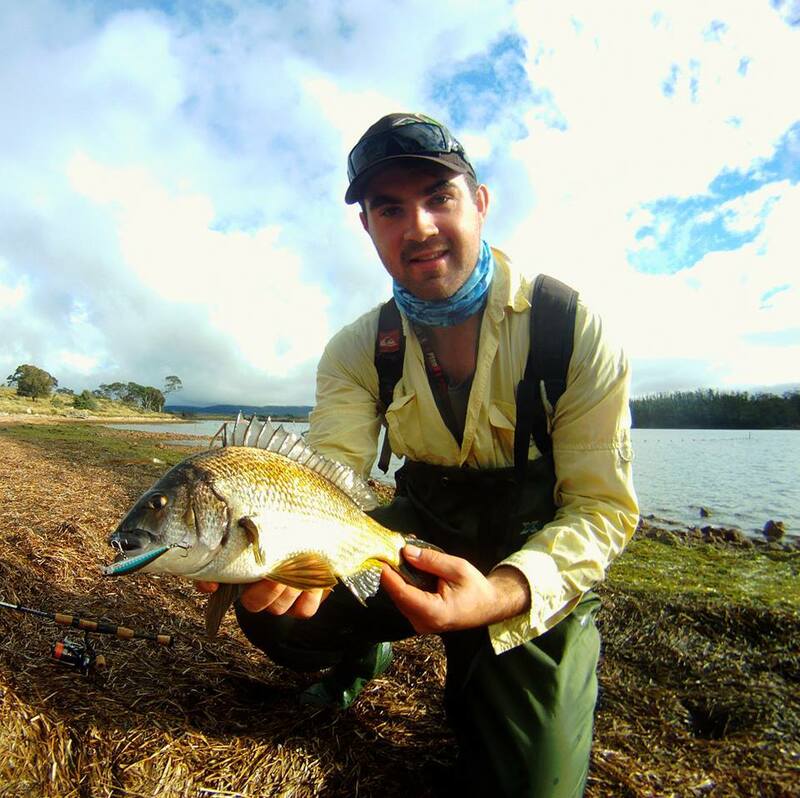 Bluewater Tackle World Myaree staff member Laith with a fat Cervantes dhu that nailed a jig! 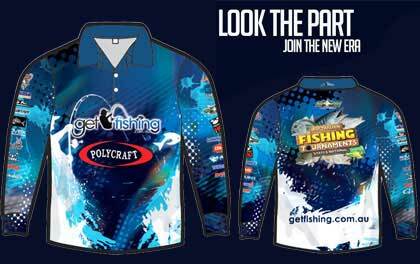 Image source: Bluewater Tackle World Myaree. Big seas have made it hard to get out over the past few weeks but those who have got out have been getting into some red hot demersal and pelagic action. 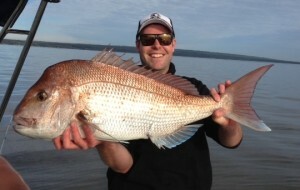 Reports include heaps of red throat emperor and plenty of pink snapper up around the 7-8kg mark. Notably a few cobia to 20kg have been taken on live bait in 50m, a few mahi mahi just outside the bank and a few yellowfin up to 20kg have also been landed. On the crustacean front reports of large hauls of crays are still coming in which is good to see and the odd blue swimmer is being caught in the marina. Bluewater Tackle World manager Cam Trowbridge was treated to some exceptional fishing at Shark Bay recently by the accommodating staff and crew at Mac Attack Fishing Charters. Cam and his mates spent a few days up to their armpits in countless varieties of species on lure and fly. According to Cam, everything they touched turned to Gold as the skipper held his word location after location putting them on the money every time. Among the highlights were mackerel on fly and stickbaits and mulloway in 5-10m of water. While only small the mulloway were in plague proportions. Prior to their arrival fish up to 36kg were landed! Countless other species were landed during their time on the water including blue bone and rankin cod. Bluewater Tackle World’s Cam Trowbridge getting rank in this photo aboard Mac Attack Charters in Shark bay. The pink snapper fishing was red hot although they did became a problem simply due to the fact that most were over the maximum size limit of 70cm. Now that’s a problem I could live with! 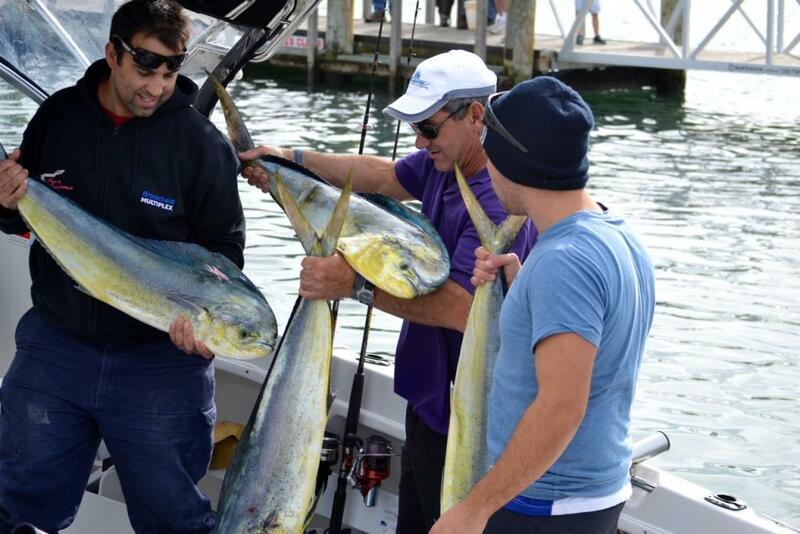 Mac Attack Charters changed management last year and they are now offering Perth fishos very affordable 3-day packages from $602 including return flights, accommodation and a full days fishing. 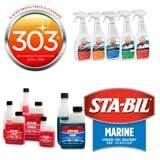 Package stands for June only so be quick. This Exmouth land based GT was one of 5 Dylan Picken and his mates landed during a session mid-May. Tackle HQ’s Tyrone Yahiha and Quentin Fisher along with regular customer James Perry embarked on a mission to the Montebello Islands in late May. A good Coral Trout taken by Tackle HQ’s Quentin Fisher on the stick shad by Sebile. Image source: Tackle HQ. The trio were in the thick of things for a few days while they fished and slept in the comfort of their Haines Signature. Plenty of GT to 30kg were caught during the trip but unfortunately the breaks weren’t hard enough to stop the estimated 50kg monsters that had them buried in the reef on a number of occasions. Tackle HQ’s Tyrone Yahiya grinning with the first GT of the Montes trip taken on the running tide around the islands on a Temple Reef reefer 711 and Patriot Designs Fat Pat. Image source: Tackle HQ. The boys were treated with warm clear warmer for the entire trip and amongst other captures were the usual suspects including coral trout, spangled emperor, estuary cod, blue bone, longtail tuna, Spanish mackerel and queenfish. Most fish were taken on topwater offerings with the Maria Fully Loaded a standout performer. James Perry holding a Montebello Islands GT landed on his genblack travel rod and 3000 luvias. Image source: Tackle HQ. Keith from Fisherman’s Paradise had an interesting encounter earlier in the week. While the suspect probably smelled a bit fishy he was not of the piscatorial type. Keith’s encounter was with an iced-up drug addict who entered the store and proceeded to try and knock off a couple of high-end reels. The suspect was caught in the act as he shoved two reels worth a combined $1500 down his pants. After taking a few cheap shots at Keith the thief was scared out of the store empty handed before driving away in his beat up old Mazda. Fishing around the metro area has been good. King George whiting have now come on full swing and should remain hot for the winter months. 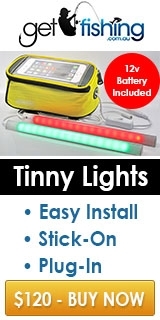 Fish are averaging 45-48cm and are providing great sport for inshore anglers using light line. Snapper fishing has also been firing. Fish anywhere from pan sized up to 13-14kg are widespread along the metro coast to the peninsula. 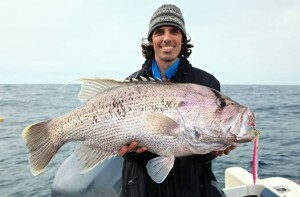 The coastline between Adelaide and the mid-south coast has also been producing good catches of salmon between 1-4.5kg. 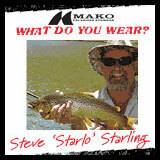 The usual ganged pilchards and small casting lures up to 60g are doing the damage. 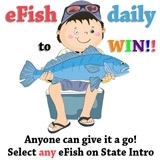 Reports from the estuary have been few and far between but there have been school mulloway up to 1m getting caught. Currently south Aussies are experiencing an in-between season. The warmer weather species are starting to slow down and the winter species are yet to show up in numbers. In saying that, Fuzz from Fuzzell’s Fishing Adventures in Arno Bay has reported good numbers of squid around and some really big ones at that. Hefty specimens around 1kg and up to 1.5kg are not uncommon. Fuzz’s jig of the moment is a green Yo-Zuri with a red and yellow belly. Others that are doing the damage are Shimani Camaro jigs in white or black. Garfish are still around but numbers are starting to back off. Snapper fishing has been consistent but for very few larger fish. Most snapper being caught are ruggers in the small to medium size range. Blue swimmer crabs are still around. While not in big numbers you can still expect to catch a feed. Along the western gulf between Port Lincoln and Whyalla the King George whiting have been very quiet, whereas west of Port Lincoln reports of KGW have been quite good. While on the subject of Port Lincoln it is worth mentioning that the salmon are running and if it’s these silver bullets that tickle your fancy it’s well worth a shot off local beaches and inshore waters. The Murray River System has still been producing fantastic Callop fishing with some monster fish up to 6kg being caught recently. Anywhere from the lower lake to the NSW border is worth a shot. 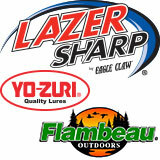 Spinnerbaits, hard body lures and live shrimp are apparently the bait/lures of choice. Those who prefer fishing with shrimp would want to stock up as numbers are set to dissipate after the long weekend as they settle into the mud for the winter. 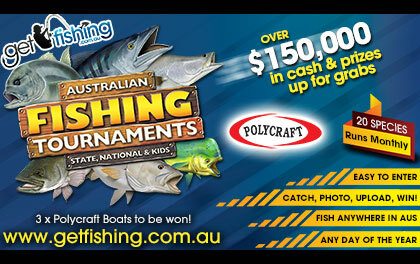 If it’s Murray cod that gets your heart racing then now is the time to nail that monster you’ve been dreaming of. Now that there’s some clarity in the water it’s time to start throwing the bigger lures in search for that 1m+ cod. Numerous reports of meter plus fish are coming in, with at least one fish at 1.4m being caught in the last week or so on a large hard body lure. With the arrival of cooler weather local anglers are now targeting winter species. Calamari fishing has been red hot in Port Phillip Bay providing plenty of entertainment for both boat and land based anglers. 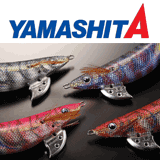 Among the artificials doing the damage are squid jigs such as the 2.5-3.0g Yakamito Chameleons. Both the Fishing Fever and Compleat Angler Bentleigh have a wide range of the latest squid jigs available so if you’re running low on jigs pop in and ask the guys what sizes and colours are doing the damage. 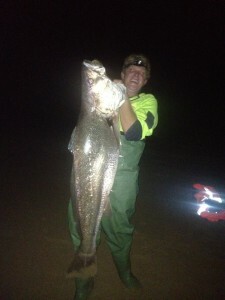 Fishing Fever staffer P1 with a rather large squid caught at the bottom end of the bay. 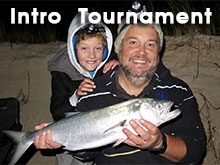 Image Source: Fishing Fever Mordialloc. There are still reports of salmon pushing up into the Patterson River as well as Victorian surf beaches, Western Port and Port Phillip Bay. 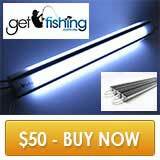 Those that are catching them have been casting plastics and small metals with good results. In Port Phillip Bay and Western Port there’s been some nice snapper being caught. Ricketts Point was one location that was mentioned and is also holding good numbers of squid and pike. Western Port is also holding big fish as Andrew Ludlow and his mate found out early in the week during a hot session where they caught and released two snapper at 8.3kg and 9.3kg. An example of the quality of snapper in Western port lately. 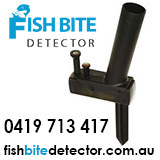 Image Source: Fishing Fever Mordialloc. Portland, Apollo bay and Port Fairy are still experiencing a phenomenal run of southern Bluefin tuna including a few fish >100kg as well as some ripper mahi mahi. The preferred method for most anglers targeting tuna has been trolling using Richter and Black Bart skirted lures. Portland mahi mahi. 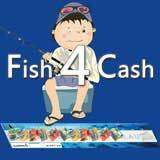 Image Source: Fishing Fever Mordialloc. On the freshwater scene there been reports of brook trout and Atlantic salmon being caught in the Rubicon River. Lake Eildon has also been firing according to the boys at Fishing Fever. 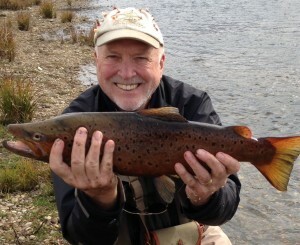 The legend himself, Rex Hunt, fished Eucumbene River recently with good mate David Grishold. The pair ended up catching 15 fish in total up to 4lb. Rex Hunt with a lovely brown trout caught on a recent trip to Eucumbene River. Image Source: Fishing Fever Mordialloc. News on the freshwater scene is that the majority of inland waterways are now closed to fishing until the start of October. Check local regulations for more information. Places like Craighbourn Dam are open all year round and have reportedly been stocked recently. Whether or not this is the reason it has been fishing well for brook trout remains unknown but it is likely. 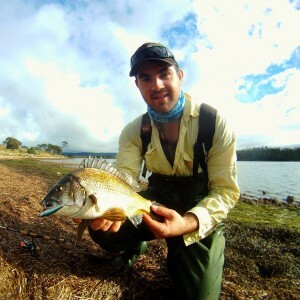 Adam Neville sent in this image for our May Rapala Fish Of The Month comp of a nice Tassie Bream he caught recently. 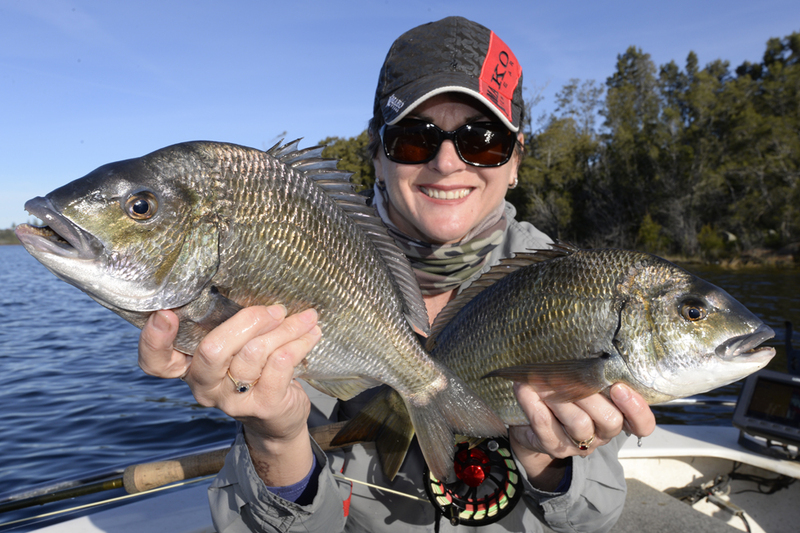 In the estuaries there’s no surprise that bream are on the hit list of many anglers. This time of year the shallows and backs of bays are great places to target big bream on shallow diving minnows like Panish 55’s for example. Spot On Fishing Connection staffer Isaac has been having some terrific sessions on monster bream up in the shallows including one session where he landed fish at 47cm and 45cm to the fork. In other inshore news bigger than average calamari are being caught on the east coast and both flathead and salmon are starting to slow down. 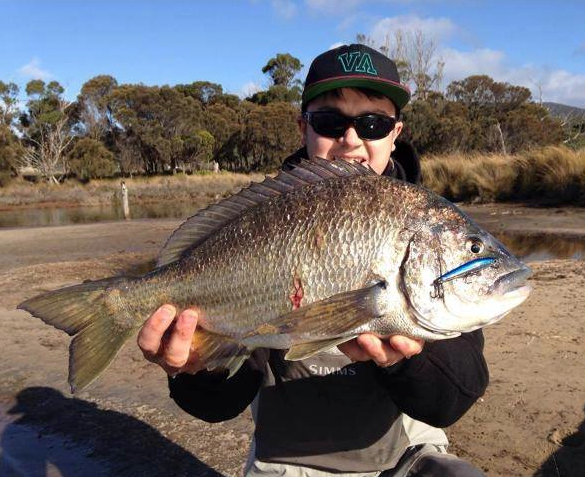 Spot On Fishing Connection staffer Isaac landed this monster 47cm FL bream in the shallows. Image source: Spot On Fishing Connection. 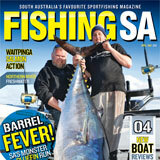 Offshore southern Bluefin tuna are still being caught, 12-15kg being the average size. A couple of bigger fish have been reportedly been lost down near Pedra Branca. The weather on the east coast has been quite calm of late meaning fishos have been heading farther afield in search of greener pastures and reports of good catches of stripeys are coming from around Pedra Branca, Flying Scud Rock, Eddystone and Mewstone. Spot On Fishing Connection’s manager Andrew Large took advantage of the spell of good weather and achieved his long time goal of catching a Bluefin tuna from his 13ft dinghy. 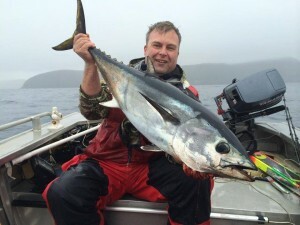 Spot on Fishing Connection’s manager Andrew Large with a dinghy-caught southern bluefin tuna. Image source: Spot On Fishing Connection.